With use of the Polarie, taking wide filed photographic images of constellations, the Milky Way, shooting stars and bright comets is surprisingly simple and easy. The Polarie sets up in less than a minute, even for users not familiar with the direction of the celestial pole at your location. Simply turn the Polarie in the direction of the Polestar in the northern hemisphere (or south celestial pole in the southern hemisphere) using the compass, tilt-meter and polar sight hole that are all provided with the Polarie. 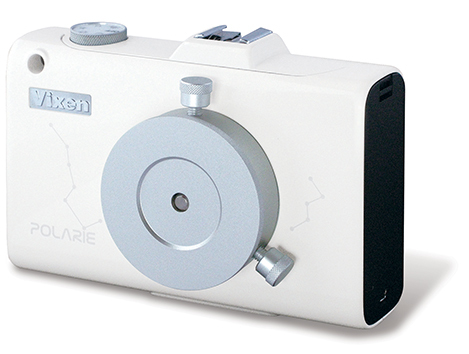 The Polarie is designed to work with your photographic lens that takes wide-angle shots of constellations. The Polarie can work for more than 2 consecutive hours with two AA-size alkaline batteries. You can take the ultra-compact and lightweight Polarie anywhere with you to creating stunning images of the night skies and "Star-Scapes". ?Specification and appearance may change without notice for an improvement.